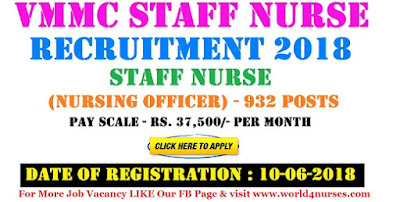 VMMC (Vardhman Mahavir Medical College & Safdarjung Hospital) Has Released Recruitment Notification For 932 Staff Nurse Posts. All Eligible And Interested Candidates Can Attend Walkin Interview On 25-06-2018 (25th June 2018). 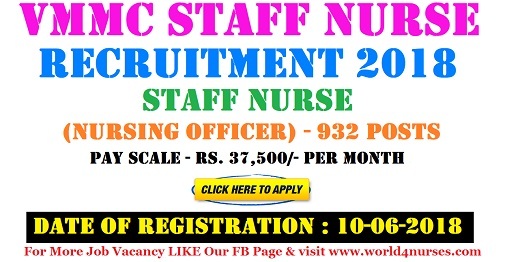 Further Detailed Information Regarding Educational Qualifications, Age Limit, Selection Procedure, Exam Pattern, Syllabus for VMMC (Vardhman Mahavir Medical College & Safdarjung Hospital) Recruitment 2018 - 932 Staff Nurse Post is mentioned below. Age Limit - Candidates age should be between 21 to 35 Years As on 01-01-2018. Pay Scale - Rs. 37,500/- Per month . How To Apply - All Eligible and Interested candidates are required to attend walkin interview along with relevant testimonials to the following Address on 25th June 2018. Address -OPD Counter, New OPD Complex, VMMC & Safdarjung Hospital . Walk in Interview Held On : 25-06-2018.Important Note - The Date of Registration Would Open on 10th June 2018 (Sunday) From 10:00 AM to 01:00 PM at OPD Counter VMMC & Safdarjang Hospital. Click Here For VMMC Recruitment 2018 Detailed Advertisement.